Thank you so much. This was really helpful to answer a couple of questions for me. Thanks for the thoughtful analysis. You changed my mind on a few issues and reaffirmed on others. Thank you, this is helpful!! Thank you so much for explaining these proposed amendments and referenda on tax exemptions, Deborah! I have not seen much about them in the media, even though I have looked. Athens for Everyone did have a very brief guide, but their explanations seemed less clear than yours. This will be a great help to me in voting. Thank you VERY much for all this detailed information. I appreciate all the research you have done; it has helped me to figure out which items I will support! Thanks, this information was very helpful. Thank you. Your analysis on the Marsy’s law (Amendment 4), and the link to see exactly what it said, were particularly helpful. Thank you for posting this information. I just wish I had it before I voted (early voter). It definitely would have changed how I voted. When we lived in California, it was common to receive this type of info well in advance of the voting dates. It is difficult to get a complete picture on the amendments – you have to visit many web sites. I should have visited your site before voting. This will help many people as they go to the polls. Thank you for all your hard work. I am so glad I found this today as I head out for early voting. 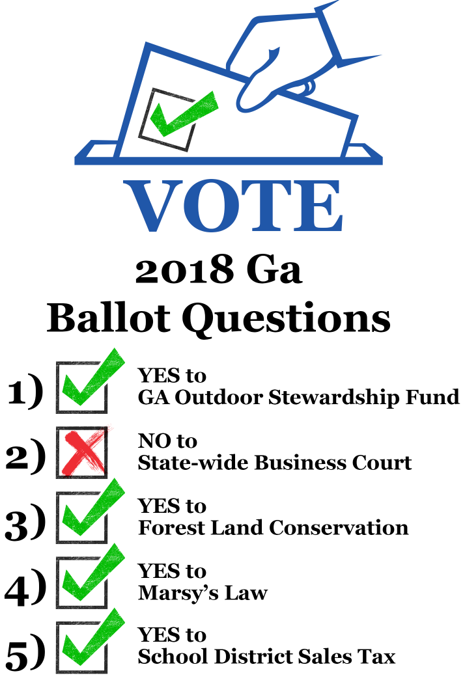 I’ve read several opinions on the amendments, but I appreciate your historical background re Georgia prior votes and your logic for your votes. Thanks. I’m glad somebody is finally talking about the amendments and referenda. I searched and found basically nothing in the major news media, just a recitation of what was written. The only thing I found before this was in the Northside Neighbor, of all places! I’m generally suspicious of amendments but they will all pass, they always do. Well done analyses, especially A-2, which is horribly vague and dangerous to due process to even be considered an appropriate amendment. I’m concerned — remain undecided — on so-called “Marsy’s Law.” But find myself leaning yes on basis of the two points in its favor that you raise. Again, as written, wording seems vague as to limits on victim’s rights. I was concerned they might abrogate due process for accused. Secondly, I noted that it duplicates existing practices regarding notification, etc. However, I did not know this was not codified. Doing so seems like a good idea to me, on reconsideration. 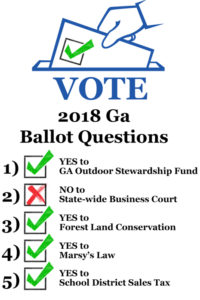 I may not be a constituent in your district but I am a supporter of any representative who has done her homework as thoroughly as you have and publishes her thinking to aid all GA voters in making the best decision for all Georgians in this important election. Thank you! I appreciate the information about the amendments. I can’t seem to find anywhere why these need to be amendments, as opposed to laws or regulations. Why do we need to amend our constitution to make these happen? Thank you for clearly explaining the amendments and referendums! I really appreciate you taking the time to document this information and share it with the public.